Jack White and Dan Auerbach aren't exactly Muddy Waters and Howlin' Wolf, but it's hard to conceive of the blues still thriving in the 21st century without their efforts to incorporate it into their work over the past decade. With White establishing himself as a solo artist, and Auerbach's Black Keys becoming a radio fixture, 2012 was a year when a new generation followed their lead, or at least recognized the link between Jon Spencer and the Rolling Stones. Here are a few more artists who have picked up the torch. 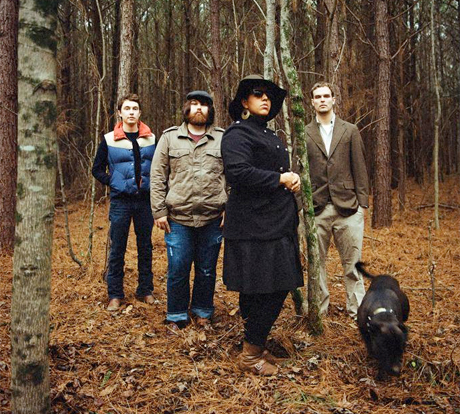 With their debut, Boys & Girls, this young quartet fronted by powerhouse vocalist Brittany Howard showed once again how blues and soul is part of the common language in the South. Relying on sheer guts, they became the new favourite band of anyone who cares about rock'n'roll. The hype surrounding the Austin-based Clark as the guitar-hero-in-waiting has been building for some time, so it wasn't surprising that some critics were poised to bash his major label debut Blak And Blu for overreaching. Instead it showed Clark's determination not to be pigeonholed, and his diverse approach to blues is sure to inspire more like-minded artists. This British combo's 2010 hit "How You Like Me Now" gave them all the earmarks of a one-hit wonder, popping up on countless TV shows and even at an Obama election night celebration. But the band proved they weren't going away with their 2012 album The Glorious Dead, which uses blues as a foundation to explore many avenues, albeit in a quintessentially eccentric British manner. For lowdown, sweaty, gutbucket roadhouse thrills, few have been able to top Lewis and company in the last couple of years. Although his current album, Scandalous, came out in 2011, the Austin native is still riding high on its raw energy, having made the rounds at all the major festivals. Expect a new album in 2013. Canadian Content: Matt Andersen, the burly Cape Breton shouter who has received international acclaim for his current album Coal Mining Blues; the Coppertone, led by singer/guitarist Amanda Zelina, has a full-length debut for Dine Alone Records in the works; and the Harpoonist & the Axe Murderer, the Vancouver duo who were the talk of the Western Canadian Music Awards this year on the strength of their current release, Checkered Past.